How much does it cost to travel to Bruges? How much money will you need in Bruges? €99 ($112) is the average daily price for traveling in Bruges. The average price of food for one day is €41 ($47). The average price of a hotel for a couple is €94 ($107). Additional pricing is in the table below. These average travel prices have been collected from other travelers to help you plan your own travel budget. How much money do I need for Bruges? Located in the northern part of Belgium, in Flanders, Bruges is one of the most charming and well preserved cities in Europe. With its stone streets and charming shops, it is a postcard perfect city that seems to have jumped out of the pages of a Disney fairytale. The city itself is quite compact, adding to the charm and making it easily walkable. Even given its old world charm, it manages to present a cosmopolitan air as well. There's an active nightlife, but during the day the historical city center is best enjoyed at a leisurely pace. You can take a carriage ride through the cobblestone streets or you can wander around on your own. Be sure to swing into some of the museums, cathedrals, and churches you'll see along the way. There are now shops everywhere that are designed to appeal to tourists. While some may be easy to walk by, it takes the strongest souls to ignore the chocolate shops you'll see on your way. Some say Bruges has moved too much in the direction of tourism, giving it an almost Disney World like feel. The city has been cleaned up and renovated, and with the changes it's lost some of its authentic, down to earth, character. It's a balancing act for any city hoping to attract tourists without the feel that it is set up to attract tourists, and Bruges is still working out that balance. Bruges weather is often cold and damp. Even during the summer months the daily maximum temperature often does not rise above 21 degrees Celsius. After October the temperatures can plunge and the winter is usually cold and damp. It rains throughout the year and if you visit during the summer, come prepared for wet weather. Part of the appeal of Bruges is its charming atmosphere. The streets are lined with quaint, historic houses and you are never too far from a canal. The houses have been cleaned up, but despite their fresh appearance, they are still centuries old. Outside of the main touristy areas, there are more quiet neighborhoods such as St. Anna, where you can still feel like you're visiting some place "real". Popular sights and attractions around town include the Groeninge Museum, the Basilica of the Holy Blood, Brewery De Halve Maan, Onze Lieve Vrouwkerk, Jerusalem Church, the Begijnhof, the Choco-Story Museum, DiamantMuseum, and the Friet Museum. Some of the most notable neighborhoods in Bruges are Market Square and Burg, St. Anna, and St. Gilles. Around the Market Square and Burg area you'll find many of the city's main tourist attractions. Market Square is located right at the center of town and it is surrounded by the Belfry Tower, restaurants and cafes. To the east of the Market Square is the Burg. This is where many museums, chocolate shops, restaurants, and the town hall are located. This area is particularly popular with tourists. St. Anna has many churches including the famous St. Anne's Church. The Jerusalem Church has beautiful stained glass windows. Other sights in the area include Bruges' Lace Center and the 18th century Sint-Janshuysmolen windmill. It's a pleasant walk to wander along the canal along Sint-Annarei as well as the cobblestoned streets. St. Gilles is a short, five minute walk to the north of Market Square. This is a quiet area that is famous for St. Gilles Church, which dates back to the 15th century. This church has many old paintings and a beautiful pipe organ. There are many affordable accommodation options in the area as well. Popular activities around town include climbing the 366 steps to the top of the Belfry Tower. This tower offers excellent, city wide views. There are also boat tours, horse drawn carriages and running trails around town. The Snow and Ice Sculpture Festival between November and January is also popular. Restaurants in Bruges are of variable quality, and unfortunately, many are overpriced and don't offer the best cuisine. A local specialty that is usually done quite well is the mussels and frites dish, which is usually served with mayonnaise. If you're looking for a decent option, you're best to avoid the Grote Markt and Burg Square areas, where tourists often fall victim to unfortunate scams. Many restaurants offer the table bread or side items under the implication that they are free, only to later charge a marked up price for these items. If you're looking for a good eating option stick to the side streets away from the majority of the tourist crowds. Also ask any local residents you may see as they will be eager to point you in the direction of their favorite restaurants. Walking is the easiest way to get around Bruges' historical center. It's small and compact enough that it makes a pleasant stroll. This is also the best way to take in the sights and the atmosphere. Buses are the only form of public transportation that is available within the city. The bus system is operated by the Flemish public transport company, De Lijn. You can also catch a taxi around the market area. Bicycles are available for rent and are a faster way to get around the city. Do watch out for the bumpy, cobblestoned streets though, which can be quite uncomfortable. 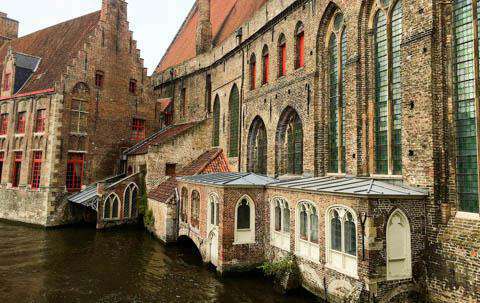 A fun experience while you're in Bruges is to take a ride on a tour boat through the city's canals. There are guides that speak most major languages and they tell you about the history of the city as you ride along. The tour is a great way to get your bearings of the city and learn a little bit in the process. The cost is less than 10 euros and will take you places you may not get to see if you stay on land.